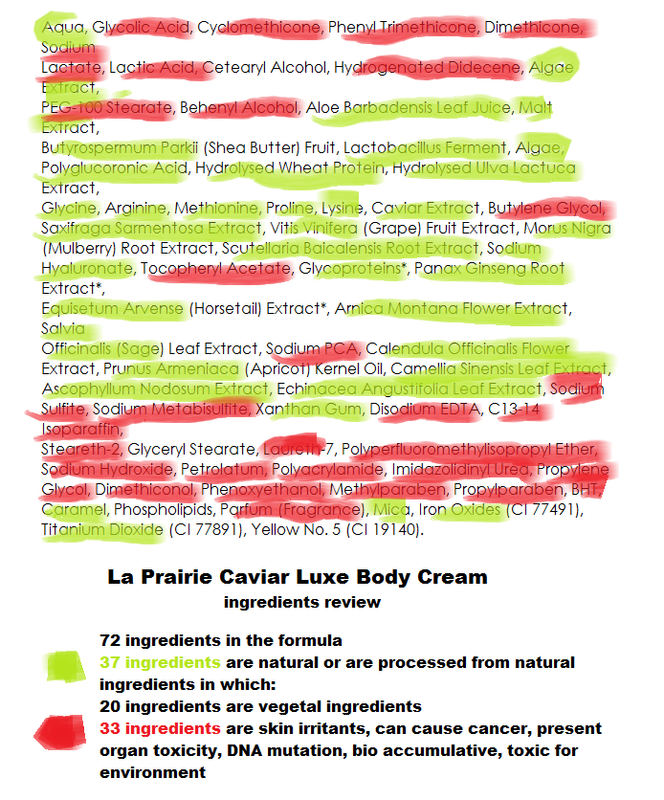 It took us forever to come up with this complete review for our challenge this week and we decided to pick La Prairie Caviar Cream. We have been traveling a lot lately and we have been hearing a lot of things about this famous and prestigious Brand named La Prairie. Some very good reviews and some hefty prices apart, lets see what the fuss is all about. It is well known in the world of cosmetics that you don’t always pay for what you get. For exemple, when you are traveling and need some rest, chances are you will stop in a Holiday Inn along the motorway. And you know that you will get what you paid for. You won’t expect amazing coffee, super comfy bed, infinity pool and poolside service. But then again, that’s not what you’re after. Now imagine you’re staying at the Ritz Carlton for an amazing holiday. Sure you will pay the price for it and you’re pretty much guaranteed to have an amazing time. Well the world of cosmetics is very different. When you look at the ingredients, most of the time you realise that you are paying for the brand, the image, the packaging rather than the actual ingredients. Sure, some brands will add actually gold dust and caviar and all sorts of amazing things (0.001 % of the finished product) but are these actually good for your skin? Maybe, maybe not but there is no solid scientific research to proove that gold actually has any benefits for the skin for exemple (although we will admit, sometimes a little luxury never hurt anyone!). is an acid derived from sugar. Depending on the concentration, it can be very dangerous for the skin. It is the second listed ingredient in the formula so we can safely assume that it is present in pretty high concentration. Organ system toxicity, bio accumulative. It is in the same family as silicone…. Is considered a moderately hazardous ingredient because of concerns regarding cancer, neurotoxicity, endocrine disruption, organ system toxicity.  Photosensitizer, with potential to increase the risk of sunburn and skin cancer by intensifying UV exposures in deep skin layers. What is Lactic Acid in cosmetic? Lactic acid is a natural acid derived from milk, fruit, vegetables and other plants. It’s found in over-the-counter skin care products used for anti-aging, and is also used in chemical peels. With a reputation for being gentler and less irritating than glycolic acid, it also hydrates, increases natural barrier lipids in the outer layer of skin, and lightens and brightens skin for those with age spots or darkened areas. Mainly, however, lactic acids and other AHAs are used to exfoliate the outer layer of skin, helping to reveal a softer, younger looking complexion, and speeding up the rate of cell turnover. In 2002, the Los Angeles Times ran a feature on AHAs, noting that the public was failing to protect their skin from the sun when using them. AHAs slough off the outer layer of skin, which makes them effective exfoliators, but in the process, they leave skin more vulnerable to the damaging effects of UV rays. That means without the right protection, they can not only lead to sunburn, but may actually make skin worse over time because of the lasting damage of sun exposure. Even worse, if skin burns, it’s more at risk for skin cancer down the road. According to the LA Times, AHAs can increase the possibility of sunburn and sun sensitivity for up to a week after they’ve been applied. Most users don’t realize that, and may use sunscreen for a day or two, but then forget to maintain protection. Even intermittent sun exposure can damage sensitive skin. Behenyl Alcohol is an emulsifier. It means that it helps the oily and water phases to mix well. It is also a filming agent and will keep the skin moisturized. However studies on animals have established that this substance can cause skin irritation (like we always say, if we feel it is necessary to test these on innocent animals, maybe we should think twice about using it at all). This ingredient is also used in treatment against herpes since this has anti viral properties. In this particular case, the molecule is named 1-dicosonal. This substance is extracted from micro organisms such as green algae. Is naturally derived from wheat and has hydrating benefits. Small percentage of population may suffer from side effects such as irritations. This is not a gluten-free ingredient. Is another algea extract which has anti inflammatory and anti oxidant properties for the skin. And again. Worth noting that these get added into the formula but natural oils such as avocado, coconut etc have all of these amino acids and more. What are the benefits of caviar on the skin? Is an essence extracted from a plant from the family of the strawberry. It is known for its whitening effect as well as its anti oxidant and pore tightening effect. It is therefore a natural anti aging ingredient. This is a natural vegetal ingredient.This root extract is also known as Baikal skullcap or Huang qin. It has been used in Chinese medicine for thousands of years. It has wonderful anti inflammatory, anti oxidant and anti allergen properties which make it a very good choice to add in cosmetic formulas. It is used to treat eczema and psoriasis. It has been shown to be an inhibitor of tyrosinase which prevents the formation of melanin. The roots of scutellaria Baicalensis contains the flavinoid baicalin which prevents UV damages. Recent researches have shown that baicalin and wogonin contained in the root extract help prevent skin thickening and slows down vascular endothelial growth, (VEGF) following UVB irradiation. Sodium hyaluronate is a sodium salt of hyaluronic acid. It is found naturally in the fluid that bathes joints, in the vitreous humor, in the eye and in skin. It is abundant in young skins dermis. And level of this compound declines with age. It can come from animal or vegetal substances. However the INCI name stays the same. Is an anti oxidant which is in the family of vitamin E. It is commonly used in cosmetics formulas. However there is evidence that it can be toxic to the skin according to the Cosmetic Ingredient Review Assessment. At least on animal study shows tumor formation at high doses according to the Environmental Working Group. is a natural vegetal ingredient which has great anti aging benefits on skin. Is an herbal extract which supports the build up of calcium in the body, nourishing the skin, hair, bones and tissues. Horstail also possesses antibacterial properties. Is a natural ingredient which has renowned anti inflammatory, antibacterial properties. Is a chemical derivated from amino acids which has hydrating properties, however it is ranked as a low hazard ingredient to be used in skin care products. This is due to its contamination with nitrosamine (known to be toxic). Natural vegetal ingredient which has been known for centuries to have anti inflammatory and anti bacterial properties. Is a chemical used as an anti-oxidant in photographic film development as well as in cosmetics. It is classified as: harmfull if swallowed, irritant, risk of serious damage to eyes, a contact acids which liberate toxic gas…. Lovely idea to rub this on your face! Is a synthetic compound obtained by the extensive process of lauric acid. It is used as an emulsifier. The CIR conducted researches on laureth 4 and laureth 23 and concluded they were all ok to be used in cosmetics. However this substance can be contaminated by 164 dioxane which is a toxic ingredient! Is a chemical used to remove make up. It presents high concerns about contamination and bio accumulation. Is a chemical ingredient used as a PH adjuster which is considered as a strong irritant! Is a petrochemical ingredient. According to Livestrong.com, the ingredient is approved by FDA, However the side effects of petrolatum include finding petroleum byproduct in breast tumors, suffocation of the skin, premature aging and agravated acne! Is a chemical ingredient contaminated with carcinogenic impurities. Is a toxic ingredient that is basically sodium lauryl sulfate. It is used as a hydrating agent but has been known to be an irritant if used around eyes. Is derived from petrochemical industry. Is a toxic and allergizing ingredient. Studies on animals have prooved that BHT can cause liver, kidney thyroid problems as well as lung issues. BHT is a tumor promoter. High doses of BHT mimics estrogen (the primary female hormone) resulting in adverse reproductive symptoms. It is also harmful to wildlife. Yellow No. 5 (CI 19140). Is a pigment allowed in cosmetic. Not overly impressed with this formulation but please let us know your thoughts in the comment section below. And as always if you have enjoyed reading this, please share!